Also check out a few of our satisfied clients "Fully Functional" sites to see just how easy it is for You to Go Mobile! Please use your "Back" button to return to this page or the link at the bottom of any of the sites to return to our homepage menu. 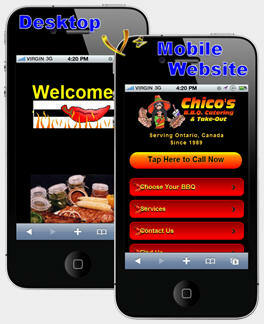 Check out Chico's Mobile site here. Visitors will see your website the way it was meant to be seen. ...on all platforms, regardless of the brand and will automatically adapt to any screen size. To see the types of Available Pages and what is included with each page Tap/Click here. Choose Any Pages you want for your mobile site and as many as you need/want, pick your "Add-ons"... tell us what you want to get No Obligations quote and Mobile Mockup: Simply contact us Today! Only make sense your mobile site uses a mobile marketing tool. Qr-codes can be used anywhere and scanned with any smartphone (App required). Your New Mobile Website comes with a FREE qr-code.